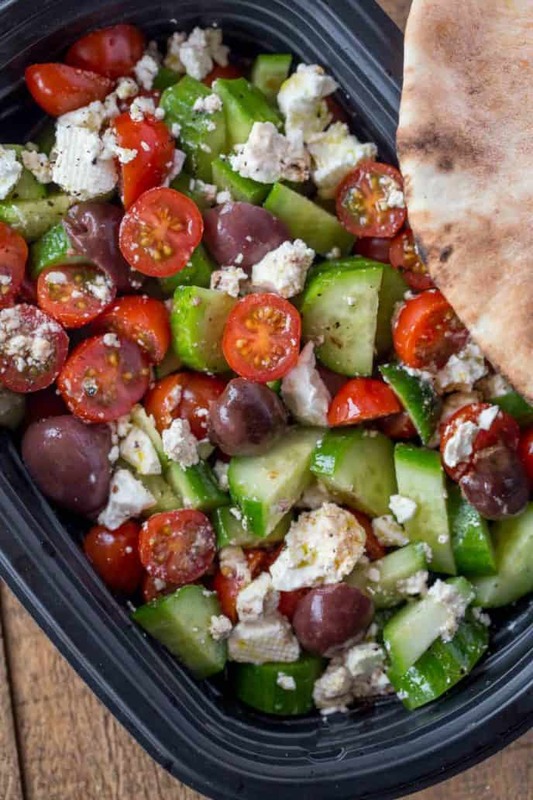 Easy Greek Salad with cucumbers, grape tomatoes, feta cheese and kalamata olives with a lemony red wine vinaigrette dressing in just five minutes. Salads without lettuce make for easy side dishes you can make ahead and serve at picnics and large events. We also love making Easy Broccoli Salad, Three Bean Salad, and Easy Pasta Salad for easy options. 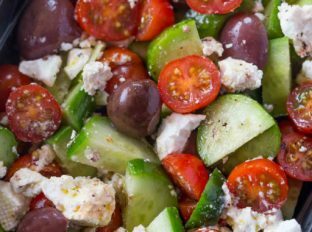 Greek Salad is a popular salad because of it’s easy and bold flavors. 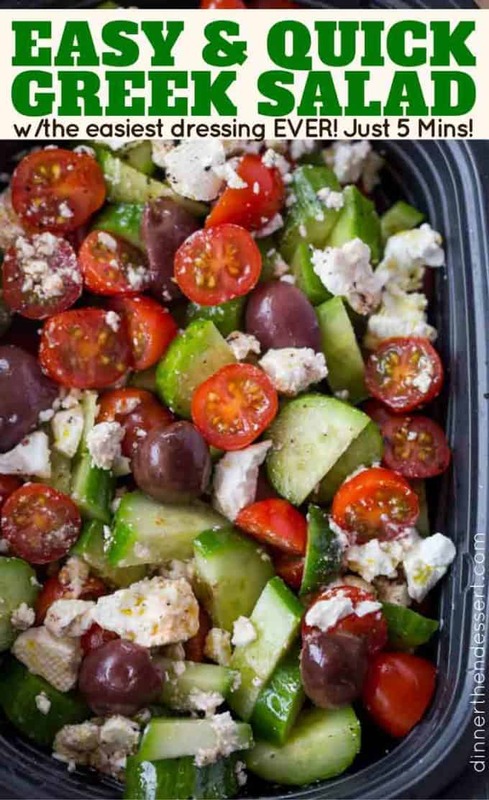 Greek salad is full of cucumbers, tomatoes, olives and feta in a lemon juice and olive oil vinaigrette. You can add extra protein and bulk to your recipe by adding chunks of chicken or chickpea to the salad as well and add extra veggies like bell peppers and red onions too! You can also look at my Greek Rainbow Vegetable Salad to see a much more veggie heavy recipe. Even better? The total time to make this dish is right around 20 minutes and 18 of them is just chopping up the vegetables. Greek salad is the perfect healthy Greek option to make along side other fantastic Greek and Middle Eastern Recipes. 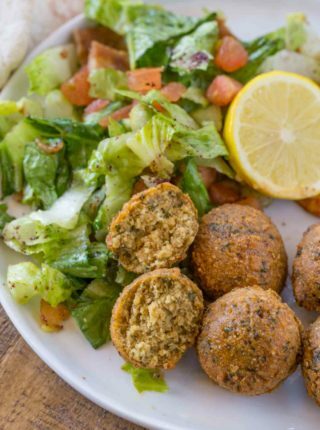 We love serving this Greek Salad with Falafel, Hummus, Pickled Turnips, Greek Meatballs, Greek Chicken and Rice, Greek Pastitsio and my super popular Copycat Halal Chicken and Rice. Persian Cucumbers which are crispier and firmer than standard cucumbers. You can also use English Cucumbers instead of regular American cucumbers. Grape tomatoes which hold their seeds in instead of flooding your salad with tomato juice. Creamy Bulgarian Feta – use a different variety like Greek or French if you’d like but try to find a block of feta in liquid. 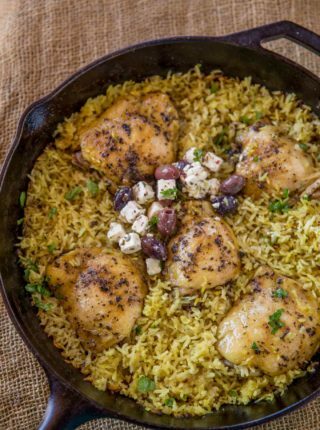 The pre-crumbled variety is dry and flavorless compared to the fresh creamy feta you can buy. Red wine vinegar and lemon juice which add a punch of flavor. Kalamata olives – don’t add sliced or chopped olives to your salad, kalamata olives add a rich, briny flavor to round out your salad. If you’d like to make this dish heartier add tortellini to the mix, but make double the dressing as pasta will soak up more than you’d think. If you want to make a makeshift “fattoush” salad, toss the salad with pita chips and top with some sumac seasoning. Add some lettuce or arugula if you want to add fresh greens to the salad as well. If raw red onion is too harsh for you place the chopped red onions in a bowl of ice water for 10 minutes before removing and drying them. This will remove some of the raw onion bite from them. You can bulk up the salad more with bell peppers too, red would be the best as they’d add sweetness but green would work too. Just know green bell peppers would add a hint of bitter flavor to your Greek salad in a way no other ingredients in the recipe would. Kick this recipe up a notch and cook the recipe! If you were to use a recipe for Roasted Vegetables (best use for this salad would be: red onions, red bell peppers, yellow bell peppers, green bell peppers, zucchini, grape tomatoes, eggplant) then let them cool and toss them with the Greek Salad Dressing and top with kalamata olives and feta dressing you will thank me. Want a more filling version of this salad? I also make an Easy Greek Pasta Salad that may be a bit more up your alley if you’ve got a heartier appetite. What is a Persian Cucumber? They’re only about six inches long, with a smooth skin. Most cucumbers have a waxy feeling and people tend to peel the skin. A Persian cucumber doesn’t need to be peeled. They also don’t have any seeds like you’d see in a normal cucumber and they’re crisper. How long does Homemade Greek Dressing last? A homemade dressing lasts 1-2 weeks in the refrigerator due to the fresh lemon juice in the recipe. 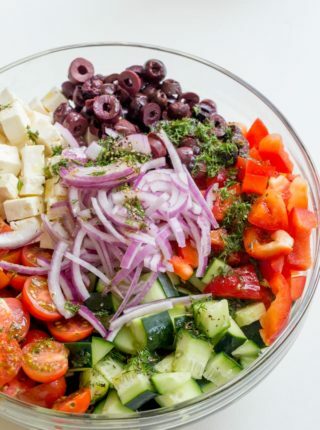 There are a couple schools of thought when it comes to dressing a Greek Salad. Since there isn’t any lettuce in the salad you can technically dress the salad as early as you’d like, but be careful of a couple of different things. First, please do not dress then refrigerate with the tomatoes added, refrigerating tomatoes makes them mealy. 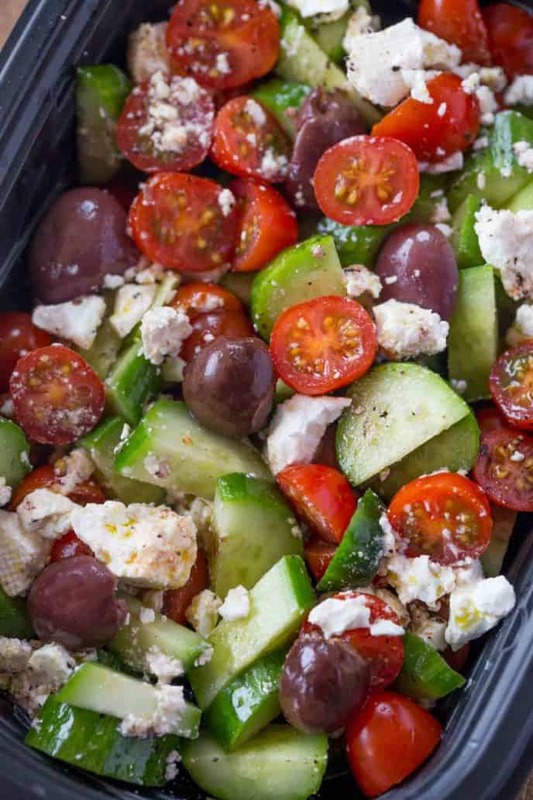 Second, if you dress the salad and don’t refrigerate be sure you don’t do it longer than 2 hours before serving as you have feta cheese that will require refrigeration. My suggestion? Toss the salad with the dressing in the morning as needed (it can stay at room temperature) then top with your crumbled feta cheese just before serving. Add the ingredients together and whisk well together right before dressing your salad. If you’d like to have a more thoroughly emulsified dressing you’d need to add a creamier fat like mayonnaise. This Greek salad dressing recipe also works great as a marinade for meat. You can let your chicken marinade for 2 hours before grilling. Add the olive oil, red wine vinegar, lemon juice, oregano, kosher salt and black pepper into a large bowl and whisk. 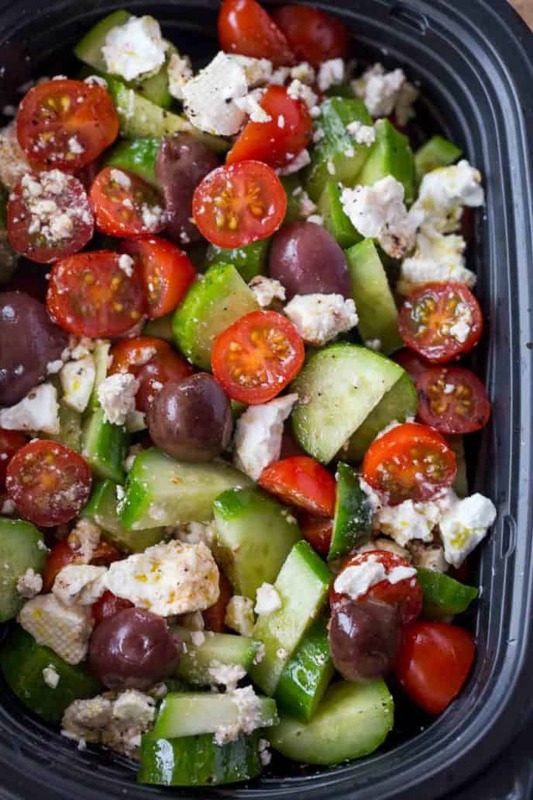 Add the cucumber, tomatoes, feta and olives to the bowl and toss lightly. Hi Sabrina, I followed your recipe to make a huge salad for dinner along with a main dish of course. My hubby and teen age son devoured it! I was hoping for some leftover for lunch the next day but noooo. Thank you for sharing this recipe with the world. You’re welcome, Ann. I’m so glad you all enjoyed it. I guess you should double the recipe next time, haha! I’d definitely call this one a winner then! Tasty, but the amount of oil seamed excessive. I’d cut it by half and add as needed. In to the fresh dill, I added some fresh Italian basil and a bit of time… Because I’m a rebel. No onions in this one, Pam! If you want onions, you might want to try my Greek Rainbow Vegetable Salad. If you were making this ahead of time- would you wait to mix the dressing with the veggies until just before serving? or would you make it all together and keep it all in the fridge until ready to serve? Thanks!! I would probably do it right before because it’s so easy to put together but this can definitely be made ahead of time and refrigerated with no issue. Good stuff! If you like feta and you like Calmata olives, you’ll like it. 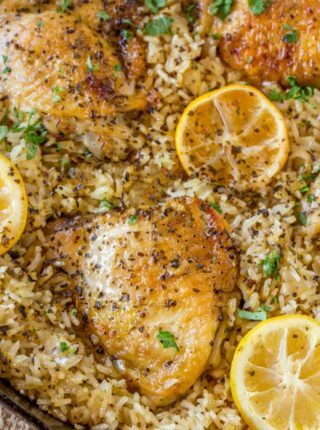 It’s delicious, healthy, economical and super easy to put together. It’s a win for me. So glad you enjoyed it Kathy! Anything with feta cheese is perfect for me! Isn’t there lettuce in a Greek salad? You can definitely add lettuce if you’d like! I will try it tomorrow, it’s yummy, thanks Sabrina.